It is the dream of every firm big or small to have a robust and fully serviceable office premises. But this comes with its own set of problems. The larger the office, the tougher it is to ensure cleanliness. Huge commercial or official buildings that have large number of working staffs employed in various departments and sometimes in round-the-clock shifts mean that dust and dirt get accumulated no matter how hard one tries. Moreover, in a lot of commercial complexes that house more than one firm and their offices, a large number of facilities such as lavatories, lobbies and parking spaces are shared. The burden of maintaining the hygiene and cleanliness of these areas is thus to be collectively borne. Another challenge that a lot of modern corporates face is that office complexes are almost always sealed and air conditioned. They are also home to a large amount of fixed and immovable equipment and furniture that makes regular manual cleaning extremely tough. Hence in order to overcome all the aforementioned problems and ensure a perfect, congenial and hygienic working environment, most modern offices install Central Vacuum Systems. We at DrainVac recognize this need and stand ready to support your journey towards a beautiful and pristine office space! DrainVac Central Vacuum Systems once installed, are extremely portable and can be moved throughout the office space with great ease. The main power unit can be placed away from the working area in the office and the vacuum cleaner can be moved as per cleaning requirements. 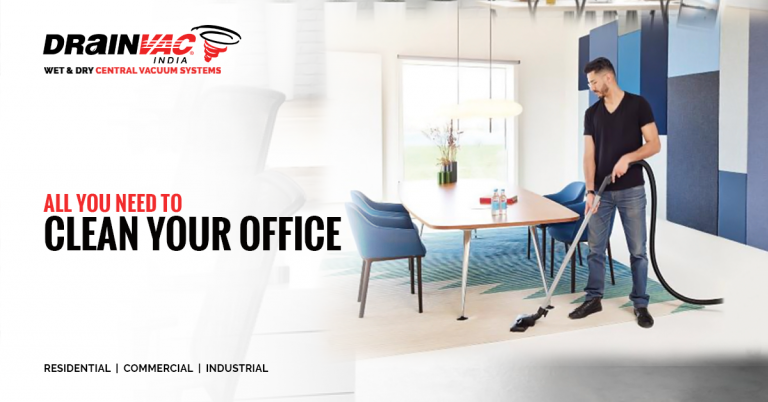 DrainVac Central Vacuum Systems are very user friendly and easy to operate and with just a basic amount of training, even someone new to office housekeeping can do a very good job of ensuring cleanliness. No special instructions or skills are required and the cleaning process is simple and quick. The high-power motors of DrainVac Central Vacuum Systems are very successful at pulling dust and other dirt particles that generally float free within closed office spaces. This is because closed office spaces see a lot of human activity on a daily basis, such as a large number of people breathing, working, eating and walking during working hours. All this activity generates large amounts of microscopic dust, dead skin cells and other allergens that if not cleaned regularly can lead to a very unpleasant working environment. DrainVac Vacuum Systems once fitted can be used periodically without disturbing the working hours and helps dislodge and vacuum out even really stubborn pollutants such as the deadly dust mites. 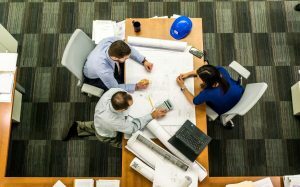 It has long been studied and observed that a hygienic and clean working space greatly improves employee morale, and better motivated employees work more effectively in the long run. 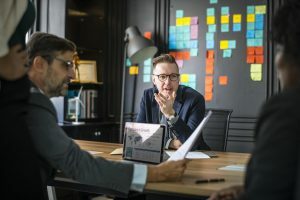 Employees also feel a sense of unspoken gratitude towards the firm as it is clear that factors such as health and safety are being taken care of. Regular vacuuming also ensures that indoor office spaces remain dry and cool during the otherwise damp and humid monsoons. All in all, DrainVac Central Vacuum Systems are many times more powerful than conventional vacuum devices and this makes them idle for office spaces large and small. Their portability and ability to be used multiple times a day, makes them a favorite for company owners. For more information, get in touch with one of our cleaning experts today.